The independent film industry is packed with films shot on location. Some say the choice is to shoot a more realistic setting, while others talk about the bottom line cost savings. But I’ve found the advantages of shooting on a soundstage to greatly out weigh the benefits of shooting on location. One of the first benefits of shooting on a sound stage is its ability to determine what’s in your blood or DNA. When shooting on a sound stage, if you’re overwhelmed by the sense of boredom and it seems fake looking, then film is not a part of who you are. On the other hand, if you’re charged up by how you can turn the fake into something extremely real and your mere presence on a soundstage excites you, then you’re definitely wired for film. 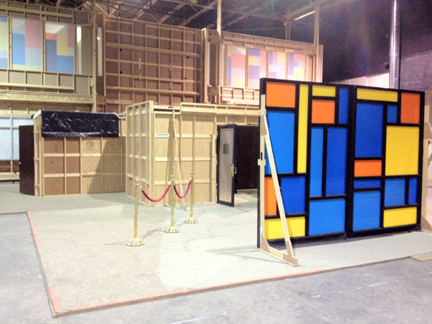 A set built on a soundstage looks exactly as it was designed and it can have moveable walls to give the camera all the space it needs. It’s also available 24X7, giving the team access throughout preproduction to make sure there aren’t any surprises during the shoot. Some directors also take advantage of the prebuilt sets for rehearsals. Most stages have plenty of facilities, workshops, cafes, and offices. This allows the team to save on travel time and provides various necessities during a long day of shooting. And when the sound stage lacks some needed accouterments, trailers can be located nearby covering every possibility. I’ve never worked on a film that didn’t require a return to a certain set for pick up shots or a reshoot. If everything is housed in a soundstage, then the set is readily accessible the moment the team is running ahead of schedule. Or, should a rain day hit the exterior schedule, the team can retreat to the stage to keep the shooting schedule within reason. The moment preproduction hits, the soundstage has someone working 24X7. That is something that rarely happens with rented locations, unless it’s a big studio production. With the production company owning full control of the soundstage, work can continue during any hour that might be required. Many an exterior set has been built in a soundstage to take advantage of its soundproofing. Not only does this reduce the amount of ADR in postproduction, but it also allows the sound team to capture more realistic dialog. The lighting team also benefits thanks to the catwalks and grids present on the stage. This allows the Gaffer and his team to set up more lights during down times, and gives the team more control over the film’s look, which is constantly altered by the time of day during a location shoot. Using a stage provides a certain level of security by reducing the number of passersbys or noisy fans. Some companies set up security cameras to protect many aspects of the production from theft and uses I.D. cards to limit entry to cast, crew, and VIPs. A higher level of security also helps keep information from leaking prior to the marketing team’s release date. While there are many more reasons for shooting on a stage, I have to mention just one more…It’s fun!